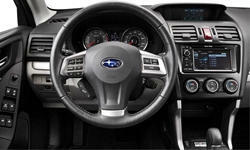 Why the 2014 Subaru Forester? All wheel drive system is great. Hard to get the car stuck in snow. Gas mileage is excellent for a full-time AWD car. I averaged 27 in mixe driving. 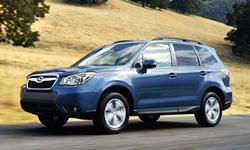 Why Not the 2014 Subaru Forester? Car was quite loud, perhaps due in part to the CVT, but also due to lack of sound deadening, probably in the interest of weight saving. Not as sporty feeling as other cars in the category. Significant body lean and din't feel as "planted" as some. Like your Escape reviews, does a good job of quickly conveying the pros can cons.